HelloI am going to do an art piece that works by the visitors alternation of seats. 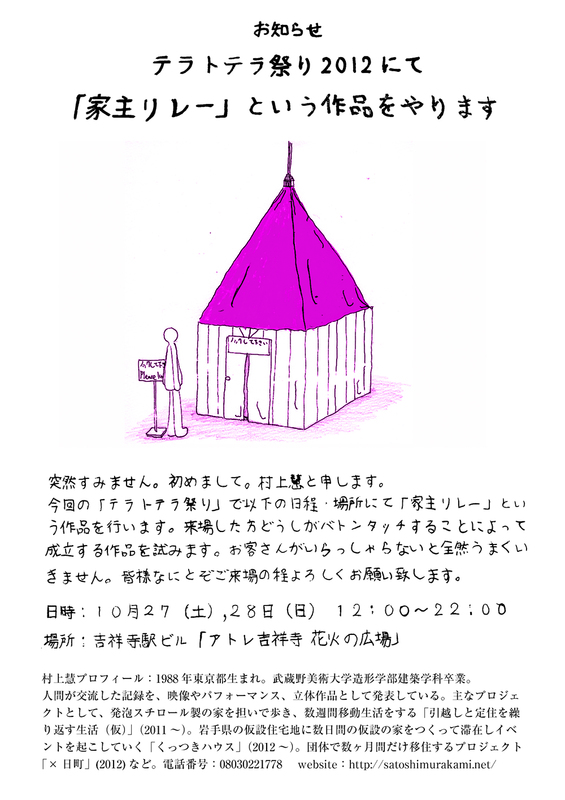 This will take place at “Hanabi No Hiroba” of “Atre Kichijoji” on 27th(sat)and 28th(sun) of October. Your attendance is earnestly requested. No reservation needed, please attend anytime you wish. Satoshi Murakami: Born in 1988. exhibiting the records of communications in between people in form of films, performances and 3 dimentions. His main works are : “Life of moving and settlement(temporary)” (2011) in which he carries a house made of styrofoam and lives inside of it for several weeks by changing the place to stay, or project “Batsukamachi” (2012) in which a group of artists build houses for each and immigrate there for several months.